The electronic signals that are recorded by the detectors during a collision can be transformed into event displays. To visualize these, we use the program MINERVA. Before you can start working with this program you should learn about its features and functions which will be used in our analysis. First, start the program MINERVA (if you are a participant of the International Masterclasses you can start the program directly from DVD; otherwise you should download the program here, unzip it, and start it). The program should look much like the first picture in the picture gallery. Use the following gallery to get some insight into the functions of MINERVA! Trying out the features you will read about is a good way to get accustomed to the program. Have fun! 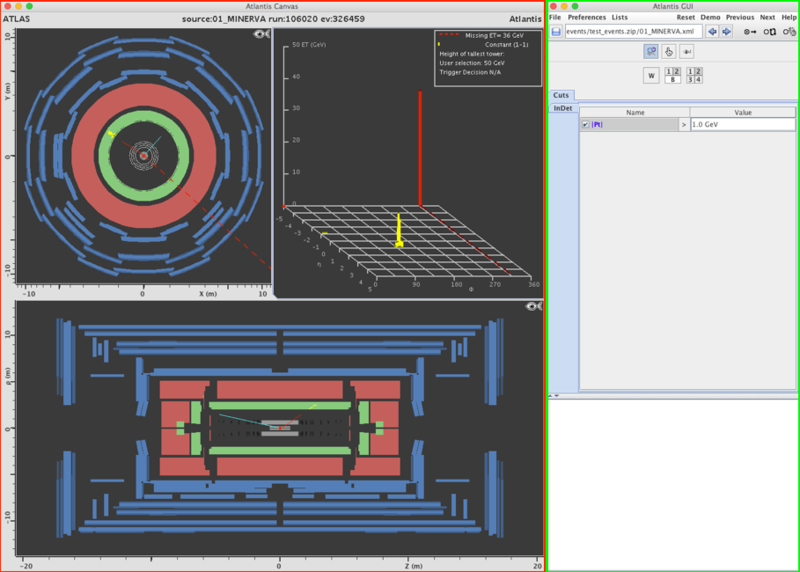 This picture shows the start view of the program MINERVA with the two windows ATLANTIS CANVAS (red frame), which provides different visual detector views of the event, and the graphical user interface ATLANTIS GUI (green frame), which controls settings and displays additional information about the event. This picture shows the CANVAS window. It visualises the event. The event is not shown in three dimensions but rather displayed in two-dimensional projections. In the upper left corner (with a red frame), one can see the detector view with the view along the beam axis – the so-called cross-sectional view – and below (with a blue frame), there is the view from the side – the so-called side view. The display in the upper right corner (yellow frame) is called the lego plot and is used to show energy deposits of individual particles in the detector. Their positions are plotted in a plane that represents the unwound detector surface. The heights of the towers indicate how much energy is deposited at each location. Every event has a title that can be read at the top of the window (green frame). The different detector shells are illustrated with different colours in the cross-sectional view as well as in the side view. 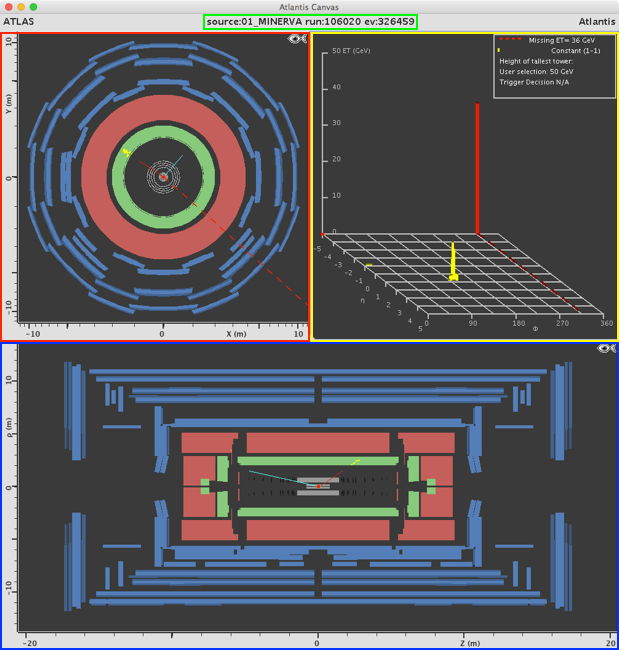 The inner detector is grey, the electromagnetic calorimeter green, the hadronic calorimeter red, and the muon spectrometer is blue. The paths of electrically charged particles are displayed by coloured tracks in the event display. They were reconstructed after the measurement. The colour of a track encodes a relevant physical quantity, the transverse momentum – the momentum of a particle at right angles to the beam pipe. The legend will help you decode it. In this enlarged depiction you can see two tracks, a red (high transverse momentum) one and blue (low transverse momentum) one. 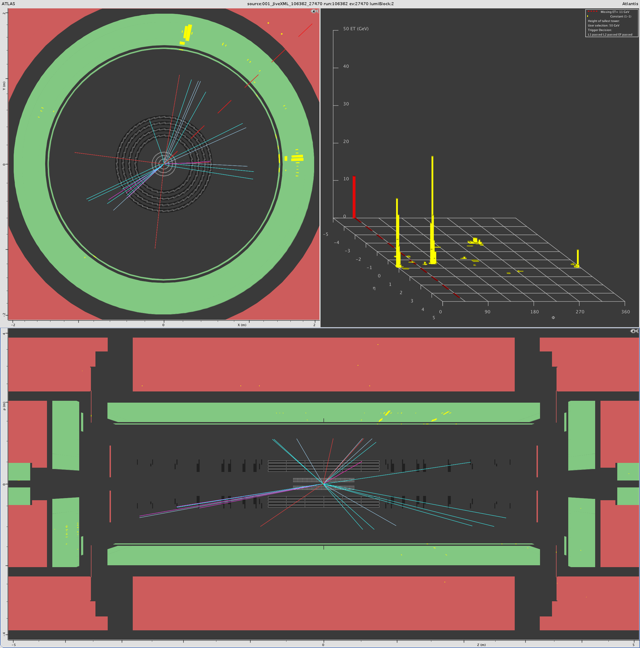 Connecting energy deposits in the calorimeters to specific tracks in the inner detector is not always easy. In this event one can see that there isn't a smooth transition from the tracking detector to the calorimeters. Here, you actually have to estimate. Energy deposits are displayed as yellow cell entries in both the electromagnetic and the hadronic calorimeter as well. Besides neutrinos, muons are the only particles that can make it from the collisions to the outer detector area. They are detected within the muon chambers (displayed blue). 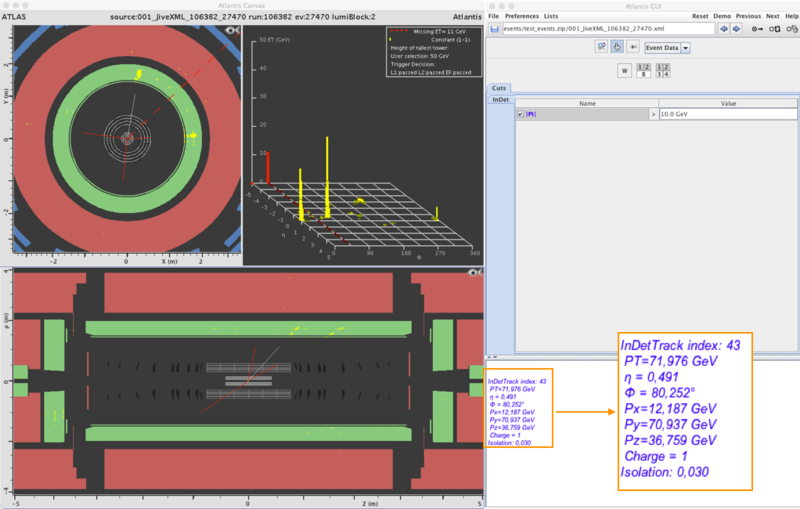 If a muon hits a chamber, information about its path through the chamber is displayed by an orange track. 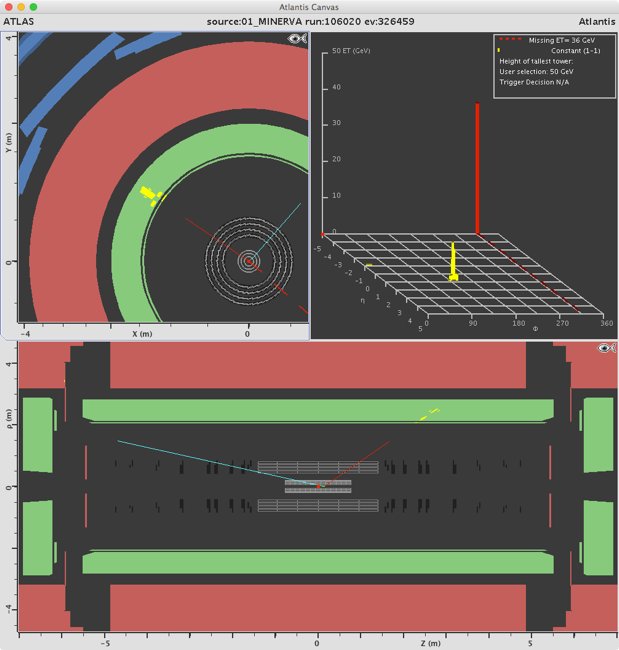 If a muon hits several chambers, one can determine its way through the chambers by combining the orange tracks. 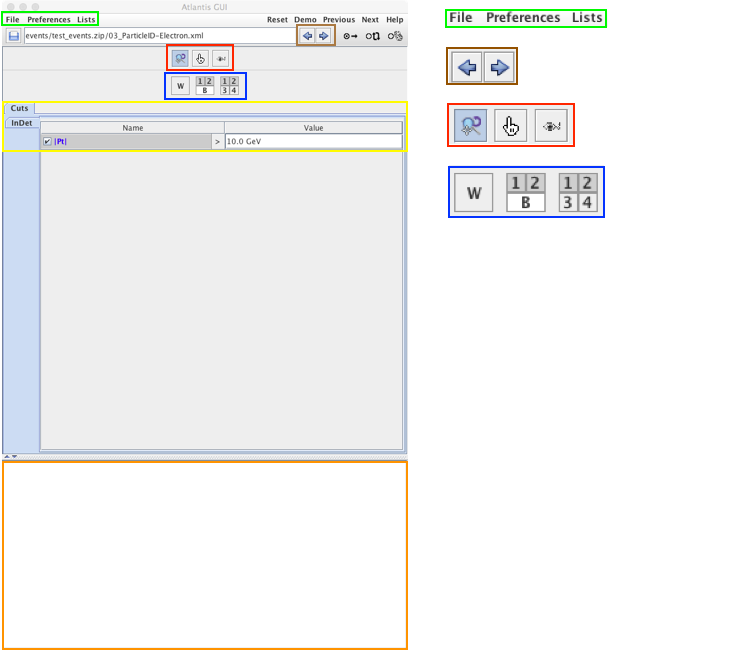 You will use the GUI window to access many of the features of MINERVA. Loading files into the program is done via "File – Read Event Locally" (green frame). The packed file to be read consists of several files each of which has saved one event. By selecting the Previous or Next arrows in the upper right menu (brown frame), you can advance or move back to individual events. With the help of the tool bar (red frame) you are able to change the view of the events (e.g. zoom in and out). If necessary you can change the layout of the views with the view selector (blue frame). Information about particles are displayed inside the information box (orange frame). You can also define special selection criteria for the particles of an event shown in the event display via the 'cuts' card (yellow frame). There is much going on inside this event. You can see many tracks. Not all of them are interesting. Particles with high transverse momentum (momentum of a particle that is at right angles (perpendicular) to the beam pipe) are of interest and can be selected. In the GUI window you can use the "Cuts" card to show only particles with transverse momenta above a specified value in the event display. To do that enter a value for the requirement on the transverse momentum in the input field (yellow frame: Try it with 10 GeV!) and confirm it via the enter key. Make also sure that the little box left to the input field is ticked. Go to the next picture in order to see the result of that setting. Now the events looks much more clear. 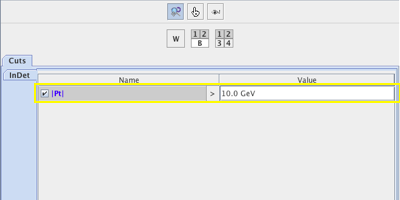 In order to get information regarding the remaining particles you can use the finger pick symbol from the tool bar. By clicking on a track not only the colour changes, detailed data will be displayed inside the information box also. You will find it on the next picture. The program is able to measure the angle between two tracks in the plane at right angles to the beam pipe. (This plane is called transverse plane.) To do so hold the “P” key down on the keyboard before selecting the two tracks. 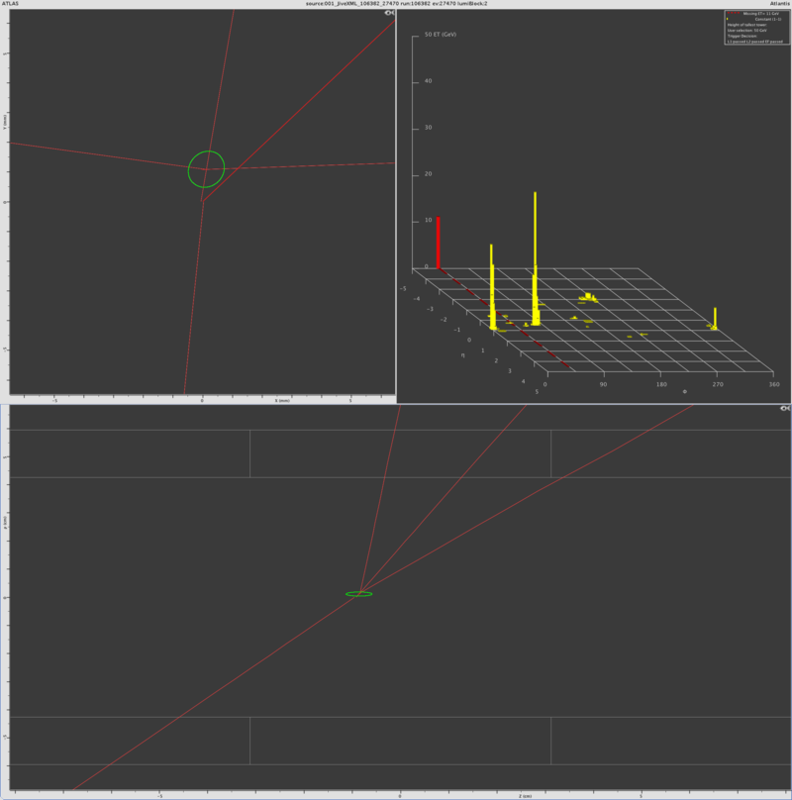 The angle is displayed in the information window in degree and radian (orange frame). Another feature MINERVA has to offer is the display of vertices. Vertices show you occasions where three tracks or more originate from a very small space. It is most likely that a proton-proton collision has taken place at these points. Often you need to know whether a set of tracks come from the same proton-proton collision, the display of vertices comes in handy here. Now, find out how you can identify particles with the help of MINERVA.